As additional reading I recommend Data Oriented Design Resources and especially the talks of Mike Acton, e.g. 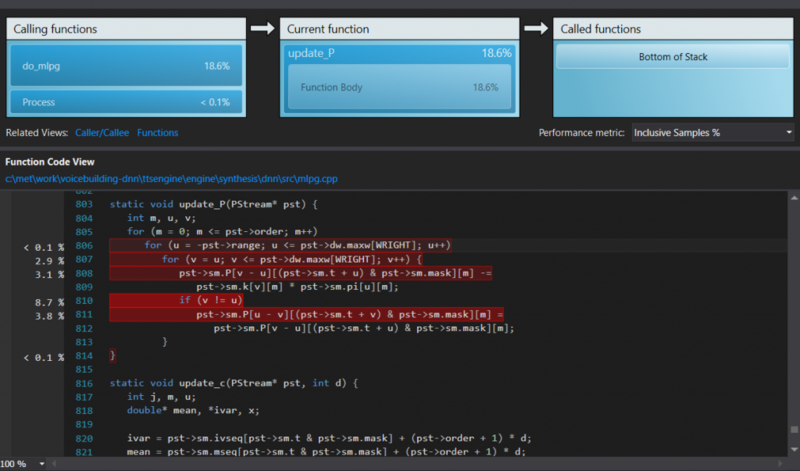 Code Clinic 2015: How to Write Code the Compiler Can Actually Optimize. Beginners Guide to Performance Profiling). At the time of writing I am working on a Deep Learning based synthesizer for VocaliD. For running on weak and older devices, I had to take a number of measures to ensure adequate performance. Interestingly, in most cases the DNN wasn’t the actual bottleneck but pre- and postprocessing via 3rd party libraries. A simple approach is to just get timestamps at different stages in your code and output the deltas. The biggest advantage of this method is that you can easily run your binary on a number of test devices and gather timing data without the need for profiling tools. You can then analyze the timing data with other tools of your choice (e.g. SciPy, R, Excel…) on a development machine. I did that at a few keypoints and it revealed that a disproportionate amout of time was spent on postprocessing. Actually a large chunk of CPU was wasted on the Maximum Likelihood Parameter Generation (Speech parameter generation algorithms for HMM-based speech synthesis) that was done via SPTK. 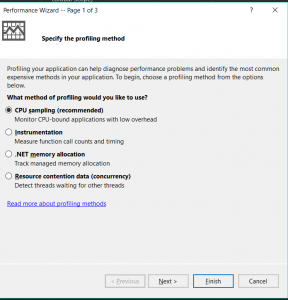 To get a clearer picture, we’ll use the set of profiling tools that come with Visual Studio. I recommend taking a look at Beginners Guide to Performance Profiling. CPU Sampling works by stopping the process at regular intervals and storing the current position of the call stack. [DNN-PROFILER] Time for MGC MLPG: 1353ms. [DNN-PROFILER] Time for MGC MLPG: 1342ms. [DNN-PROFILER] Time for MGC MLPG: 1328ms. which happens twice. First it is accessed to subtract a value from it, then the result is again accessed to write it to another location. I’ve shifted the third line to the left so it can clearly be seen that what happens here is that sm.P seems to hold symmetric values. It’s also evident that either (u-v) or (v-u) is negative when (v != u), which means that the symmetry of sm.P is before and after sm.P. This means that you have to be very careful when freeing the memory block. [DNN-PROFILER] Time for MGC MLPG: 1185ms. [DNN-PROFILER] Time for MGC MLPG: 1169ms. [DNN-PROFILER] Time for MGC MLPG: 1187ms. pst->sm.P[u – v][idx] is accessed with index m, index m is incremented in the outermost loop. So what happens here is that we don’t access our memory contiguously. [DNN-PROFILER] Time for MGC MLPG: 732ms. [DNN-PROFILER] Time for MGC MLPG: 714ms. [DNN-PROFILER] Time for MGC MLPG: 708ms. We can see that accessing the memory in this order allows the prefetcher to do its work much better and we end up with the code being twice as fast by modifying 5 lines of code and without any understanding of what the function actually does. Taking the time to understand that opens up the option to rewrite it using a linear algebra library like Eigen. Hi, I also want to use this skill to optimize mlpg in SPTK. However, the keywords “auto” and “&” is not used in C.
Hi, you are right, I integrated MLPG into a C++ codebase. I suspect this value was a double, you you’d have to work with double* and add the appropriate referencing/dereferencing & and *s.